U.S. President Donald Trump's abrupt declaration that Washington will recognize Israel's sovereignty over the disputed Golan Heights drew strong condemnation from Syria, while the European Union and countries like Egypt and Russia also rejecting the overture. U.S. President Donald Trump's abrupt declaration that Washington will recognize Israel's sovereignty over the disputed Golan Heights drew strong condemnation from Syria, while the European Union and countries like Egypt and Russia also rejected the overture. The Syrian government called it "irresponsible," and a threat to international peace and stability. The Foreign Ministry in Damascus also said Syria is now more intent on liberating the Golan, "using every possible means." Trump's administration has been considering recognizing Israel's sovereignty over the Golan, which Israel captured from Syria in the 1967 Arab-Israeli war. Last week, in its annual human rights report, the State Department dropped the phrase "Israeli occupied" from the Golan Heights section, instead calling it "Israeli controlled." A senior administration official told Reuters on Friday that U.S. officials are preparing a document to codify recognition of Israeli sovereignty of the Golan Heights. The official added that Trump is likely to sign the presidential document when Israeli Prime Minister Benjamin Netanyahu visits Washington next week. Trump's announcement marked a major shift in American policy and gives Netanyahu a political boost a month before what is expected to be a close election. The declaration is the latest in a series of moves that have fuelled anger among Israel's Arab enemies and U.S.-allied Arabs. It follows the U.S. recognition in December 2017 of Jerusalem as Israel's capital — a decision that also drew international criticism as the disputed city's status remains at the heart of the Israel-Palestinian conflict. 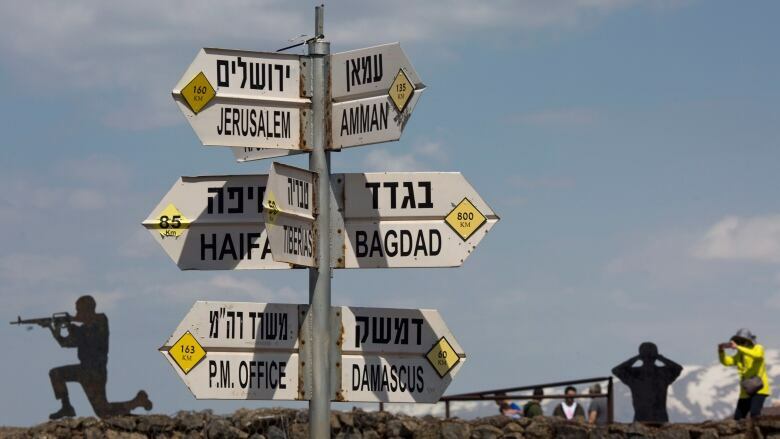 In a statement released Friday, a spokesperson for Global Affairs Canada said the country's policy on the Golan Heights has not changed. "Canada's long-standing policy is that it does not recognize permanent Israeli control over territories occupied in 1967, including the Golan Heights," Stefano Maron said in an email to CBC News. "That has been Canada's long-standing and consistent position." 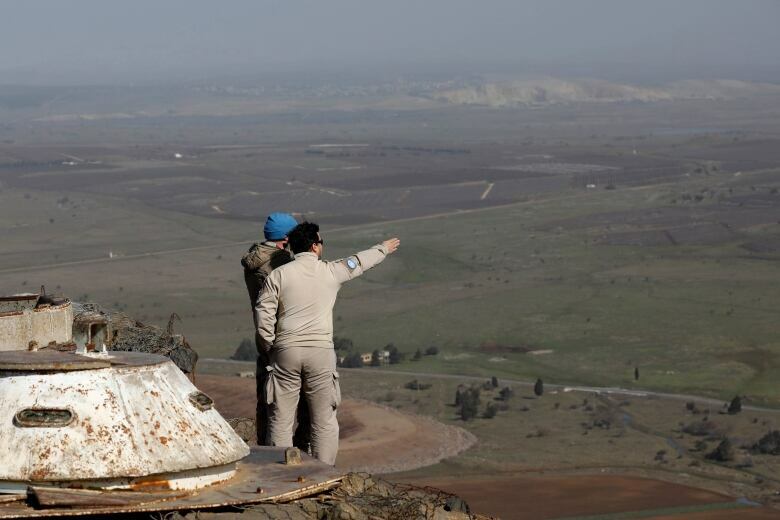 Egypt said it considers the Golan Heights as occupied Syrian land; in a statement carried by state news agency MENA, the Egyptian Foreign Ministry cited UN Security Council resolution 497 of 1981 that rejected Israel's annexation of the territory. France's Foreign Ministry said recognition of Israel's annexation is contrary to international law. 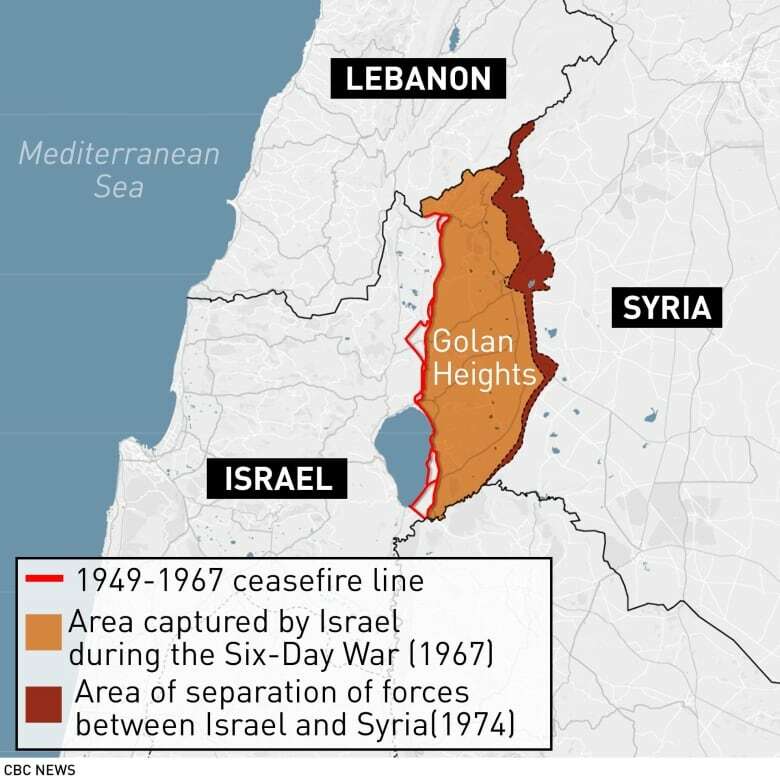 "The Golan is a territory occupied by Israel since 1967. France does not recognize the Israeli annexation of 1981," the ministry said in a daily briefing. "The recognition of Israeli sovereignty over the Golan, occupied territory, would be contrary to international law, in particular the obligation for states not to recognize an illegal situation," the ministry also said. Netanyahu faces an election on April 9 and has been pressing for the United States to recognize Israel's claim to sovereignty over the Golan Heights. Russia, an ally of President Basharal-Assad with forces in Syria, said Trump's comments risked seriously destabilizing the region and expressed hope the statement was just declaratory. Syria's Foreign Ministry later announced that a letter was sent to the presidents of the UN Security Council and United Nations over Trump's "irresponsible and dangerous statements over the Golan." The statement urged the UN secretary-general to confirm the organization's stance regarding Israeli occupation of the Golan. In a Friday tweet, Iranian Foreign Minister Javad Zarif took aim at the U.S. US is the single biggest source of instability in MidEast. It may be deluded enough to believe that persistently violating int'l law, bullying sovereign nations &amp; milking its clients projects strength. It does not. Its recklessness just displays panic of an empire in decline.